Home > Causes of Hair Loss > What is Alopecia? Alopecia is the medical term that is used to describe and characterise hair loss. This hair loss can be as subtle as a slight thinning of hair thickness, or as severe as a complete loss of all body hair. Alopecia Areata – is hair loss that occurs as patches on the body. Alopecia Totalis – is characterised by a total loss of hair on the scalp. Alopecia Universalis – is characterised by the loss of all hair on the entire body. Alopecia Barbae – occurs in men on the facial area, especially in the area of a beard. Alopecia Mucinosa – this is hair loss that results in scaly patches on the skin. Androgenetic Alopecia – begins as a thinning of the hair at the crown or as a receding of the hairline. Traction Alopecia – is caused by tight hairstyles and appears in the area of damage. Anagen Effluvium – is caused by chemotherapy and Radiation Treatments and can lead to complete hair loss that is usually temporary. Scarring Alopecia – leaves behind scars in the area affected by hair loss. Telogen Effluvium – is characterised by general thinning of the hair. If any of these conditions or characteristics resemble your type of hair loss, it is best to consult with a doctor in order to determine the extent of the condition and the best option for treatment. The main cause of alopecia is thought to an autoimmune disease. In this condition the body's immune system attacks the hair follicles in a mistaken attempt to rid the follicles of foreign debris. When these enzymes and chemicals are released in the hair follicle they cause a breakdown of the cells and inhibit the proper function of the follicle. This interruption in function can lead to hair loss, increased hair shedding, and excessive hair thinning. In addition to autoimmune disorders, there are a few other causes of alopecia. 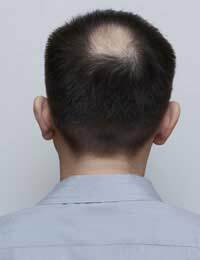 Genetics can play a big role in the onset of androgenetic alopecia, or Male Pattern Baldness. Medications, disease treatments, and some illness can also lead to alopecia, as can exposure to cleaning chemicals, chemicals used in hair care treatments, and some chemicals found in pollution. Age can also be a factor in the cause of alopecia. Ageing Hair Follicles take longer to produce new hair and experience longer resting phases than younger hair follicles. Unfortunately, anyone can develop alopecia. Some types of alopecia are more common in older individuals than younger ones, and some types are more often seen in males than females. However, your chances of developing alopecia increase if you have a close family member who suffers from the disease, or if you have a medical condition, such as a thyroid disorder, that is known to encourage alopecia symptoms. Since androgenetic alopecia is the most common type of alopecia men are more likely to develop this condition, especially if they are over 40 years old. Although Alopecia cannot be cured, treatment is possible, depending on the severity of the condition. Find out more by reading our article Can You Treat Alopecia? on this site. Im 35 and started my dreadlocks at the age of 18. recently, I cut them about 11 months ago and had patches on my head. I was told that it would grow back but, its 11 months later and its still patched up. Will my hair ever grow back without using some kind of medication?